Well, the week is finally upon us! This Friday thousands of teens (and non-teen fans of YA) will flock in costume (and not) to their local theater to catch a glimpse of Divergent come to life. I will be celebrating in my usual way for this kind of thing- in a panic that no one will come to the huge event I have planned and then rapidly winding my way through all the crazy activities I’ve planned when a ton of kids do show up. Abnegation Faction Duty – Use Metal Stamping equipment to teach teen participants how to make watch sized piece of washer bling and train your next Abnegation member how to do this. Also, for the daring I’ll have a no mirror makeup challenge set up! Candor Faction Duty – Lead teen participants through a positive honesty exercise I saw here. Divergent Faction Duty – Tattoo (temporarily) teen participants and the next Dauntless member, teach the next Dauntless Member how to tattoo. These tattoos will be created using our vinyl cutter so they’re totally unique and like nothing else out there! Erudite Faction Duty – Explain to the next Erudite Teen that you are actually in charge of the Fear Maze Entrance. Once you have debriefed the next member on how it works, go lead teen participants through the maze. Movie Previews – Blasting on one huge white wall will be the official trailers and teasers from the Divergent Website! Volunteers– So far I have 15-20 volunteers who will run all the stations. The are enough volunteers that they can each work for half the party then play the rest of the time! Prizes: We got 5 movie tickets donated and bought three paperbacks to give away. Also, a local makeup artist agreed to volunteer at the event so we’ll be giving away 15-minute on the spot makeovers! Decorations– I’ve found some great faction specific images I have cached on Pinterest for each alcove/faction activity. I’ll give away the posters at the end of the night (inadvertent help breaking down!) to kids who didn’t win our other prizes. The popcorn bags all have little Amity Trees glued to them to make it look as if it’s a government issued snack. Oh! And volunteers will be cosplaying their favorite factions! That oughta’ add to the vibe! This entry was posted in Children's Librarianship and tagged Chattanooga, Divergent, Dystopia, Programming, Teen, Theme Party, Tween, Veronica Roth. Bookmark the permalink. Hey, Susan! Isn’t fandom fascinating? I’m exploring some new avenues to celebrate and catalog it this year. 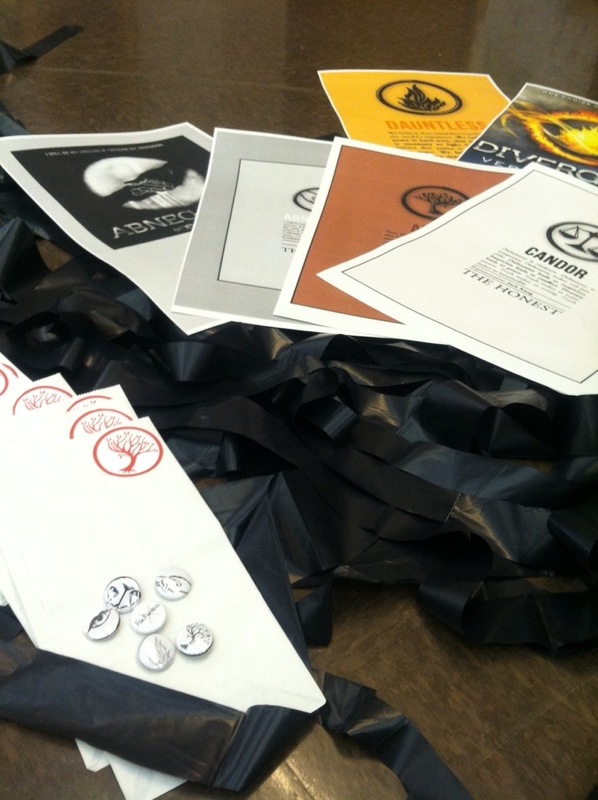 Thanks for mentioning the Divergent party, we had SO much fun!